Jeffrey Christian, managing partner at CPM Group, says there are “economic, political and financial problems ahead,” which is good for gold and silver. Jeffrey Christian, managing partner at CPM Group, shared his insights on the gold, silver and platinum-group metals markets with the Investing News Network during the Prospectors & Developers Association of Canada (PDAC) conference in Toronto earlier this month. He added that US President Donald Trump’s promise to implement tariffs on steel and aluminum imports is a strong signal of “economic, political and financial problems ahead.” Christian predicts that a market crash will happen some time between 2022 and 2024, which will be “very good for gold and silver” in the long-term. In the short term, precious metals prices “will be a little bit more calm” during Q2 and Q3. Watch the interview above for more insight from Christian, or click here to view our PDAC 2018 playlist on YouTube. The transcript for this interview can be found below. INN: We last spoke at VRIC in Vancouver and a lot’s happened since the year started. You mentioned the market at the time was due for a correction on February 5. We kind of saw that happen with the Dow Jones, which experienced its largest drop in history. What can we expect for the rest of 2018 in terms of the market? JC: Well, I think what you’ve seen since February, since we got together in January in Vancouver, I think what you’re seeing is a transition in the financial markets. We’ve been gone through an extended period of time of low interest rates, low volatility, steadily rising stock prices, and low volatility in the bond market, and relatively weaker commodity prices. And I think what you started to see with the stock market correction which really started with rising interest rates is a movement and a transition away from that long period of economic time to a period of more volatile stocks with downward exposure, more volatile bond prices with upside interest rate exposure, and probably stronger gold and silver prices, and an increased uncertainty about economic financial stability and political developments. 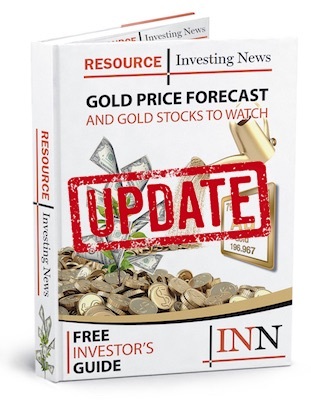 INN: We’ve seen the gold price also go higher after US President Donald Trump’s promise to place tariffs on aluminum and steel imports, raising fears of a trade war. What impact will those tariffs have on gold going forward? JC: I don’t know that the tariffs themselves will have an impact but they’re part of a larger problem or a larger set of issues which are causing financial market. I mean, the financial market instability that we’re starting to see relative to where we’ve been reflects uncertainty over US government policies and it reflects a realization that the rest of the world is going to be far less cooperative with the US and vice versa, government-wise, going forward. So I don’t know that the tariffs themselves have a major effect. But what they do is they’re a very strong signal that there are economic and political and financial problems ahead. INN: Can you talk a little bit about those problems? JC: We’d need a few days. But you have structural deficits in the United States which just got much worse with gigantic tax cuts. You have a paralyzed government which is more paralyzed than it has been over the last 20 years when it was paralyzed. You have a breakdown in international cooperation. You have a breakdown in democratic processes. You have increased volatility in currency markets. The treasury is going to need to sell bonds to cover $1.4 trillion per year of structural deficits on an ongoing basis just as the bond market is diversifying away from treasury so the demand for treasury is declining and the Fed wants to liquidate $1.9 trillion of its bond portfolio. So the demand for treasuries is going to be declining in a long-term basis while the administration is quadrupling its need to sell treasuries. That spells higher interest rates. That spells lower stock prices, lower economic growth in a long-run basis, and a host of other problems. It’s a gigantic mess that has been brewing since 2008, 2009 and it’s going to reach a boil at some point. INN: Do we know when that will be? JC: Our best guess is 2022, 2024. But really, it’s a wet finger in the air. No, I’m sorry. It’s not a wet finger in the air. There are parameters. There are a lot of people who think it will come sooner. And quite frankly, it could come at any given time. In 2009, I was speaking with people from the People’s Bank of China and we were talking about what happened in 2007, 2008. And they said, the surprise was not that the global financial crisis and deep recession occurred, the surprise was that it occurred in 2008 because they and CPM Group all thought that it would occur later, in 2009. So it’s coming. You just don’t know what occasions will trigger it to actually emerge. All of which is very good for gold and silver. INN: I was going to talk about that actually. So silver has underperformed gold, what can we expect to see there? We know industrial demand is on the rise, for example. JC: Silver is underperforming gold for a variety of reasons. Primarily gold and silver prices really respond to investment demand. And industrial demand can rise all it wants. It’s not going to drive the silver price higher, right? What you need is investment demand. And in the silver market, you have investment demand running in about 100 and higher than 10 million ounces a year. No one really knows that because there’s not a lot of good data. There’s a lot of bad data out there that grossly misrepresents the reality of the silver market. But it’s running in about 100 and 110 million ounces. For silver prices to rise, investment demand has to rise to about 150, 160, 180 million ounces. We think it will at some point and silver prices will rise. So that’s the silver market component. And then you have a bigger issue which is just that as investors look at the state of the world and say I need alternative assets, I need to diversify the currency in which I’m storing my wealth away from my domestic currency into some gold and silver too, people prefer gold to silver. They prefer gold to silver for a variety of intrinsic reasons, and they also prefer gold to silver because there are people who are relatively more effectively marketing gold to investors while there’s no one effectively marketing silver to investors. INN: On that note, what do you think of this idea of a gold-backed cryptocurrency or a silver-backed cryptocurrency? JC: Cryptocurrencies are the antithesis of gold. I mean, gold is the ultimate tangible asset. Cryptocurrencies are a ledger item. They can disappear, they can be wiped out, they can be blocked. And so anybody who thinks that they can store their gold and silver in a cryptocurrency and get to it in a crisis, they’re wrong. INN: There’s a lot of strong opinions on that point for sure. Let’s talk about platinum and palladium. It’s kind of a tale of two markets. I’ve heard somebody say that they were going to both be pulling back. What’s your view on those? JC: I think on a short-term basis, gold, silver, platinum and palladium will pull back in the second and third quarter. We look for prices to be a little bit more calm in the middle part of the year. But I think that platinum and palladium are grossly misunderstood also by the markets. There are a lot of people who think that the move from petroleum-base automotive propulsion to electric vehicles is going to come much faster than it’s going to. The auto industry globally expects that electric vehicles, if they in fact emerge, are going to take decades to really take significant market share. But I think there are people who think that platinum and palladium are dead as catalytic converter use in automobiles, and that’s not true. Our expectation is that at some point over the next decade, platinum and palladium prices could rise very sharply, expressly because they’ll be continued to be used in autocats. But the South African supply is probably going to come under renewed constraints because of the variety of political economic and financial problems in the South African platinum industry. INN: Is there anything else investors should look out for in terms of geopolitical risk? JC: Oh, gosh. There are so many. At PDAC this morning, I’m speaking on Russian and Chinese perspectives on the world as the PDAC seeks to have bigger, bolder presentations there. There are enormous international political issues that are brewing out there and that are gaining–The whole global system is up for redefinition. It’s not going to be redefined or resolved in any quick way. This is going to go on for decades probably. And there’s going to be a lot of resistance in various pockets. There’s the Europe, there’s Russia, there’s China. There’s the entire Islamic world from Morocco to Indonesia. There’s North America, the United States. There’s the aging population in the industrialized economies. There’s this massive surplus of labor, manufacturing capacity, commercial capacity, commercial real estate and retail capacity that suggests that the growth economically going forward is going to be severely constrained compared to what governments think. JC: We’ve covered a lot. I mean, just following on that last, it’s not that governments don’t–The governments think that growth is going to be faster than it’s really going to be. I think a lot of government leaders are fully aware of the long-term economic problems they’re facing. They just don’t know how to resolve them. And one of the problems you find and you see it particularly in the Trump Administration with the $1.4 trillion is they keep thinking that they can grow themselves out of this slow growth period. And what they have to do is they have to realize there are structural changes in the demographics of their countries. And what they need to do is tailor their fiscal policies to match the aging demographics and shifting in the labor market, rather than say, well, if we can grow this thing at 3 percent or 4 percent which they probably can’t on a sustained basis, then we can grow our way out of this. You’re seeing the Japanese government and a couple others, smaller country governments do that and start to say, “Look, we have to pay attention to the demographic and labor economics of our country.” We have to start running our government as if the growth rate will be, in the case of Japan, 1 percent or 1.3 percent, not 2 percent or 2.5 percent.